The YTR-4335GSII features a silver plated gold-brass bell that produces a richer, wider range of tonal colors. Durable yet light, the bell promotes easy endurance while playing. 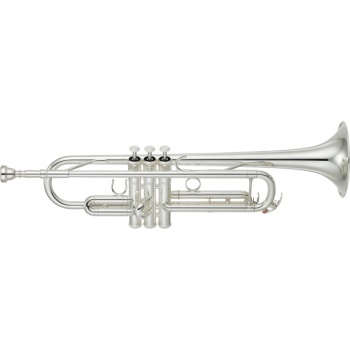 The richness of tone quality and free blowing feel make this trumpet a great vehicle for those players looking to take their performance to the next level. Gold Brass Bell: The newly redesigned, durable yet light two-piece bell is made of gold brass for a wide range of tone colors and to promote good technique and endurance. New Pistons, Valve Caps And Buttons: Highly durable monel alloy pistons as well as newly designed valve buttons and bottom caps help lengthen the life of the instrument while also maximizing sound quality.